Our track FOREVER was featured on Huw Stephens BBC Radio 1 Introducing show. CTC......as heard on Radio 1! 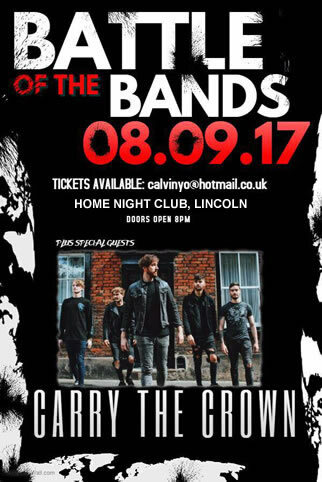 Huge HOMETOWN Lincoln show! 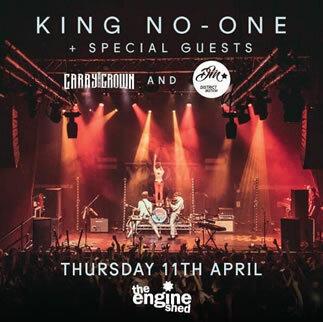 Supporting the amazing KING NO-ONE at the Engine Shed in Lincoln on the 11th April. 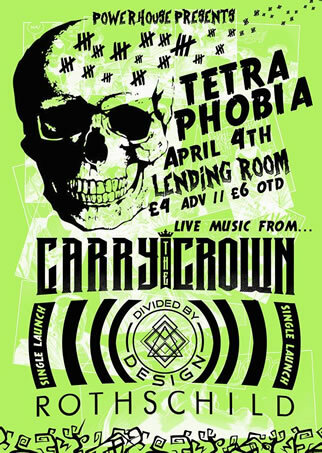 We are headlining a show at the Lending Room in Leeds on 4th April! With support from DIVIDED BY DESIGN for their single launch. 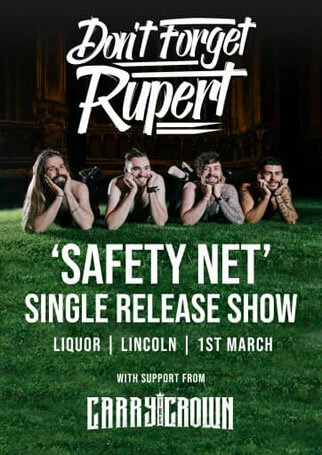 Supporting our awesome friends DON'T FORGET RUPERT with their single release on 1st March at Liquor in Lincoln. 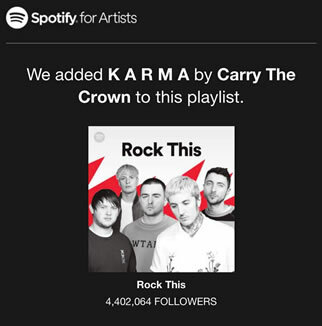 Big news, K A R M A has been added to the massive ROCK THIS Spotify Playlist with over 4 million listeners! K A R M A has been played on the largest rock music radio station in Brazil! 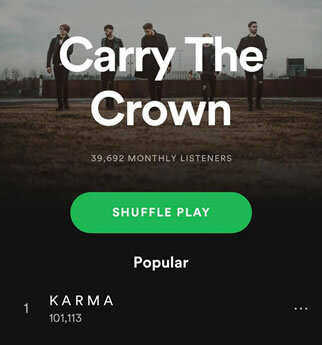 K A R M A has hit over 100K streams and we have 40K monthly listeners on Spotify. Massive thanks to you guys! 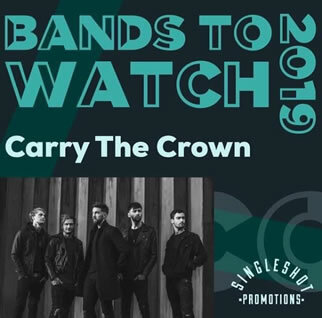 Huge thanks to Single Shot Promotions for making us one of their 'Bands To Watch 2019'! 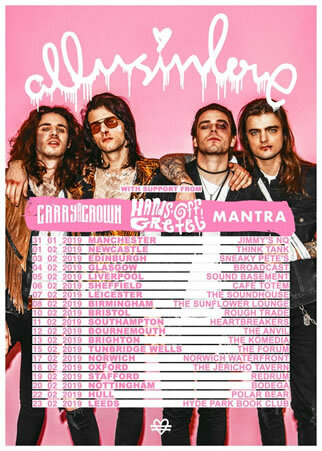 We are supporting our brothers ALLUSINLOVE on their UK tour. 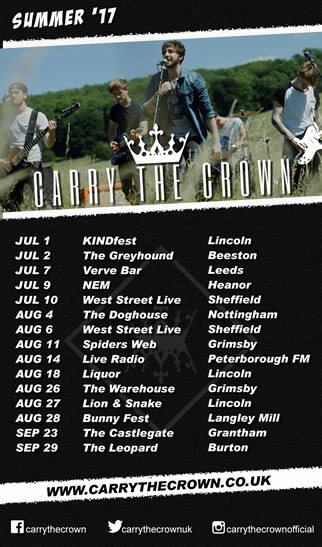 We will be playing at the Manchester, Leicester, Stafford and Nottingham gigs. 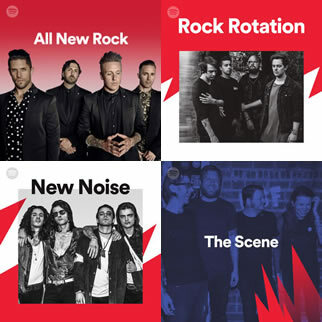 K A R M A has hit four massive Spotify playlists! Brand NEW music video released to accompany our single K A R M A! 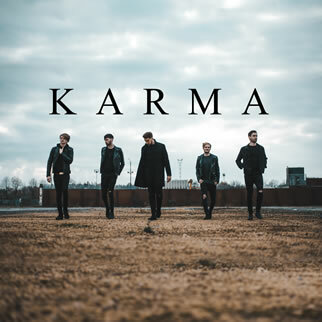 Our NEW single K A R M A is now available on iTunes, Spotify, Amazon and Deezer! Want to hear K A R M A before it is released on 10th December? 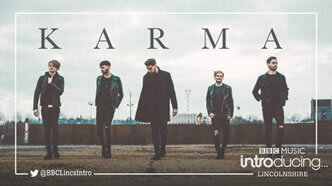 The amazing people at BBC Music Introducing Lincolnshire have the exclusive first play of K A R M A on 8th December from 8pm. 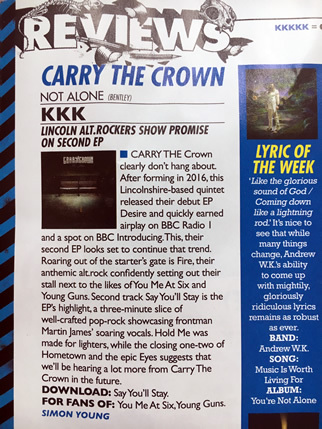 They've even made it their track of the week! 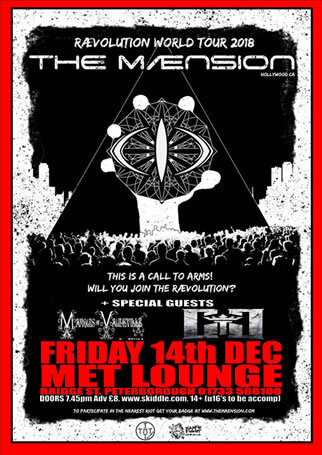 We are supporting The Maension from the USA at the Met Lounge in Peterborough on the 14th December. 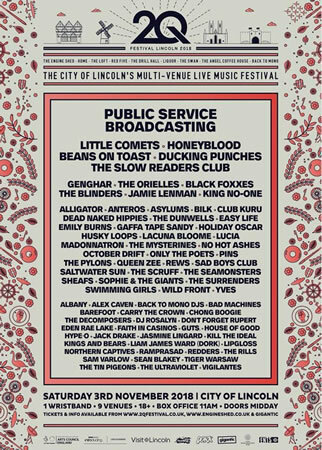 We are proud to announce that we are headlining the BBC Lincolnshire Introducing stage at the 2Q Festival in Lincoln on the 3rd November. 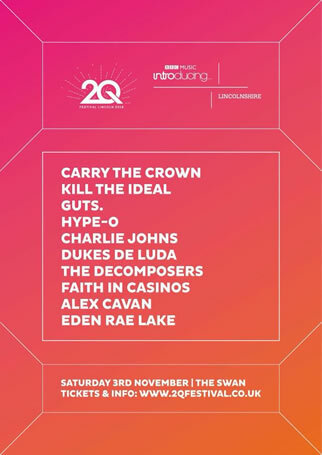 We are playing the massive multi-venue 2Q Festival in the centre of Lincoln on the 3rd November. Time to have some on stage fun inbetween writing for the studio. See you there! 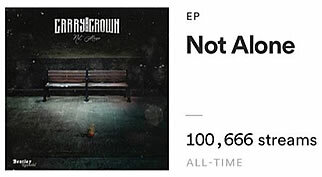 Our latest EP Not Alone has over 100K streams on Spotify. You guys are amazing, thank you! Want some exciting news? 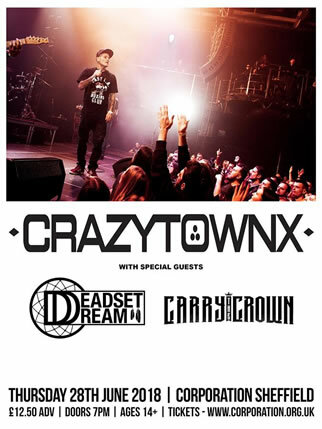 We will be supporting the amazing CRAZY TOWN along with DEADSET DREAM at the Corporation venue in Sheffield on June 28th. 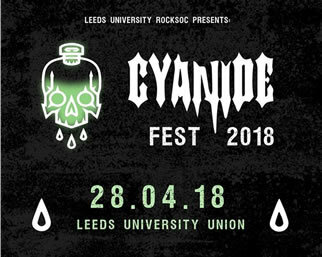 Join us on April 28th as we take over Leeds uni union for a full day of amazing music with some fantastic bands. We proudly present our headline show at Liquor on 14th April with our friends Echoic and Guts. Bring your energy Lincoln, you are going to need it for this one! 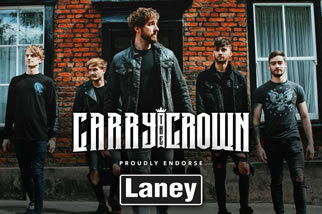 Carry The Crown are very pround to announce that we now endorce Laney Amplification. Our brand new EP 'Not Alone' is OUT NOW! Listen to it now and order a CD or download from iTunes, Deezer and Amazon Music. Spotify will be available soon. 'HOLD ME' music video is released today! The second single from our upcoming 'Not Alone' EP to be released 2nd March 2018. 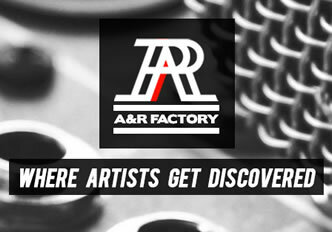 We have been announced as Siren Radio's official Local Featured Artist Of The Week! A huge thank you to them for their continued support. 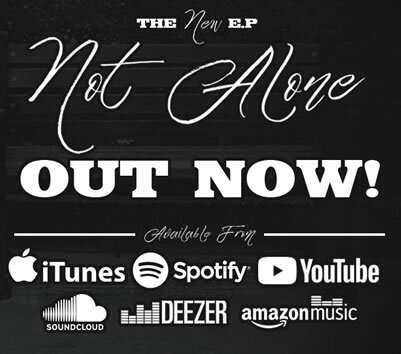 Our new EP 'Not Alone' will be released on 2nd March, don't miss out, pre-order your audio CD NOW as stock is LIMITED! 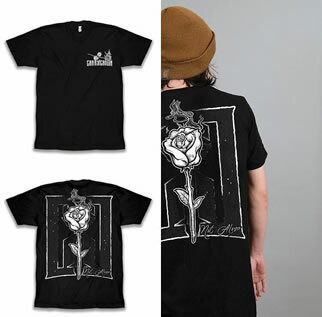 T-shirt with a brand NEW logo and design for the release of our new EP 'Not Alone' on sale NOW! 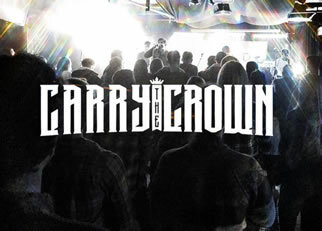 The Cozy Chronicles have written a great 'Introducing' feature about us on their website. Take a look and see what they think! 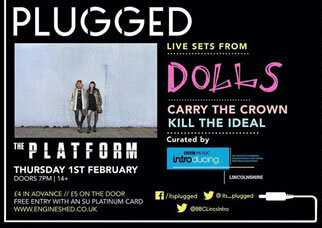 Loved our night at Plugged for BBC Introducing gig at The Platform in Lincoln. Massive thanks to all that came to see us! TOUR ANNOUNCEMENT! So excited to get out on the road with our friends Kill The Ideal. We are stoked to have our track FIRE added to Kerrang Radio's playlist with Johnny Doom. More exciting things coming soon! 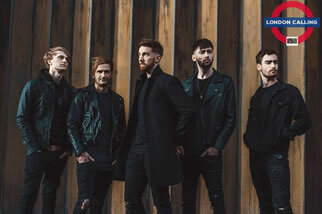 The support keeps coming from BBC Introducing as FIRE will feature on four of their programs in Nottingham, Derby, Lincolnshire and Leicester. We can't thank them enough! Our first gig of the year is the BBC Radio Lincolnshire Introducing's PLUGGED show on the 1st Feb at the Platform in Lincoln. 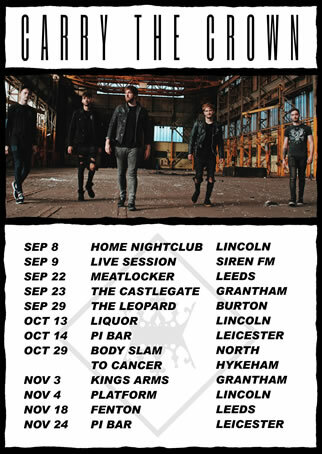 We are back with a whole new set... Lincoln are you ready? Excited to announce our endorsement and affiliation with the awesome Lincoln based Refuse To Conform unisex clothing brand! 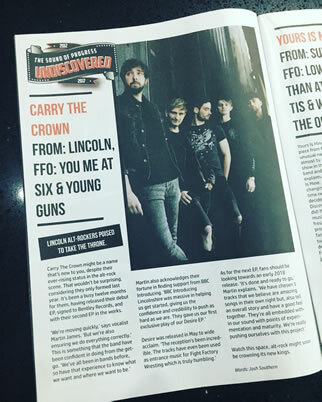 We are featured in the physical Discovered #43 magazine which is out NOW! 'FIRE' music video is released today! The first single from our upcoming 'Not Alone' EP to be released early 2018. 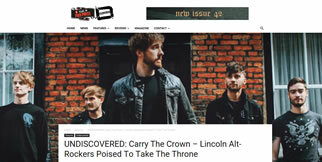 An amazing online article about Carry The Crown in the Discovered magazine. CTC find out from BBC Radio Lincolnshire that our track 'Forever' will be played on Radio 1 Introducing show on Wednesday 25th October. Thanks to the team at Radio Lincs for all their support. We just want to thank you all for an amazing Summer of live shows, we have been blown away by your support! Here is live footage of our gig at Home Night Club in Lincoln. 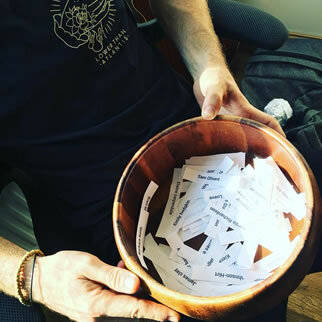 CTC take a short break from recording to select a winner for our FREE t-shirt competition held on Facebook. And the winner is.......Hazel Mae Blakey-Graham! We will contact you to arrange delivery of your prize. Thanks to all our fans who took part in our competition. 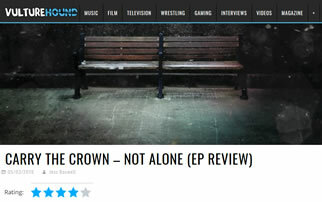 CTC will be featured on the Reverbnation website 'Crowd Picks' page from 24th October for one week. Thrilled to announce that we will be playing Sunday 1st October at the Deadbolt Festival on the Deadbolt Stage in Manchester. Such an awesome line up! 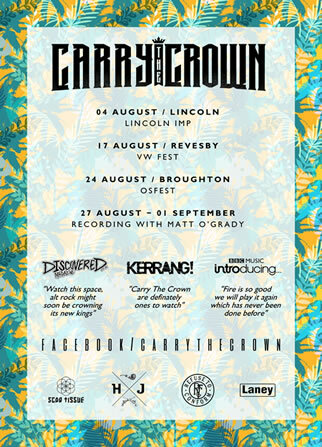 After finishing our amazing Summer shows we have another line up to move towards the end of the year. On Sep 22 we are supporting a great band from Italy called 'Why Everyone Left' who are touring the UK. We are also producing and recording our next EP in this time. We can't wait for you all to hear it! We appeared on Peterborough FMs 'Most Wanted' radio show which included an interview and 4 live acoustic performances. Here is a video with 1 minute of each song we played starting with a sneek preview of our next EPs title track Hometown. After that we played Forever then Choices and ended with a cover of Lawson's Juliet mixed with Check Yes Juliet by We Are Kings. Thanks to the 'Most Wanted' crew for a great time. We are humbled to announce we have been asked to perform as special guests at a local fundraising 'Battle of the Bands' event to raise money for the young suicide awareness organisation PAPYRUS. It will be an amazing event and we are honoured to be a part of it. 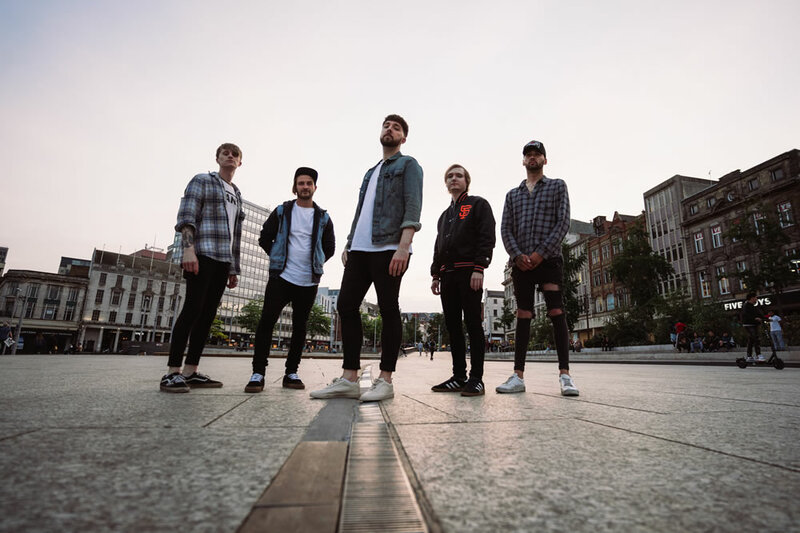 Get to know us better by listening to our interview with Chris Clarkson broadcast on Lincolnshire radio station Siren FM where we talk about everything we are doing and planning. 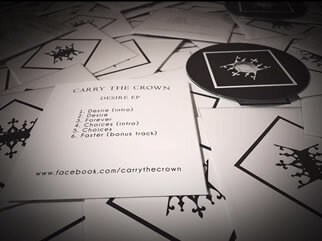 The interview also includes all songs from our Desire EP. Thanks to all the team at Siren FM for making us feel very welcome. 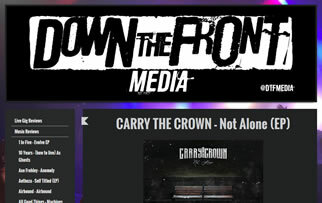 Carry The Crown is being featured on the Best Of British Unsigned music website Audio Graffiti on Tue 1st Aug at 7pm, Thu 3rd Aug at 7am and Sun 6th Aug at 10am. Thanks to Matt Graveling for the support. Following the success of our music videos we have now released the track Forever from our Desire EP. We spent the hottest day of the year filming in the middle of a field to bring this video to our fans so please enjoy and share it, thanks. Thanks to Loki Films for all your hard work. 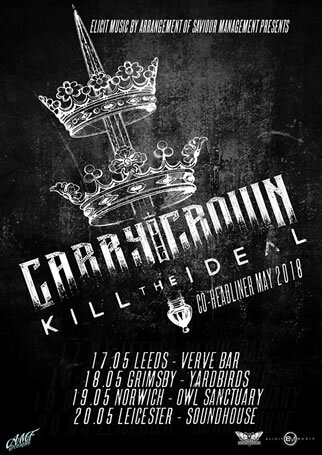 Carry The Crown are spending the Summer of '17 touring parts of the UK to promote the Desire EP and new music we have written. It's going to be crazy hard work, lots of travel and late nights but it will be worth it to bring our music to a wider audience. Hope to see you at one of our gigs! 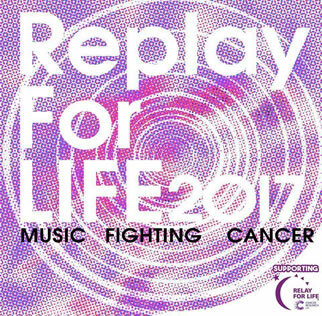 Our song Forever has been selected to appear on the 2017 cancer charity CD produced and distributed by 'Replay For Life' organisation. We are very happy to support this great cause. Following many requests from our fans we can now offer t-shirts with a small CTC logo on the front and a large logo on the back. They are made from high quality cotton and are available in black or white. Finally after many days recording and even more time fine tuning the production we are proud to announce the release of our first EP Desire. Had some amazing comments from fans new and old. 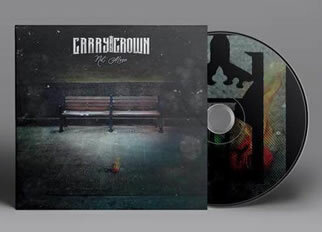 The EP can be bought as a download or an audio CD on our website. Following the success of our first music video we have now released the title song of our upcoming EP Desire as a video. This video became popular very quickly and has so far received over 20,000 views! Thanks to Loki Films for making it happen again. 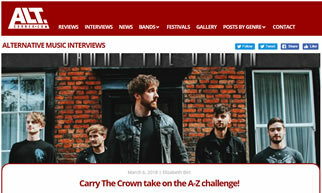 Carry The Crown were invited to Notts Music Network for an interview to talk about where we came from and where we are going in the future. Thanks for the warm welcome we received from them. Excited to release our first music video with the song Faster. Had a hard day and night filming in a very dirty warehouse to get all the parts for the video but we are very happy with the result. This video and track has been used for promotion of 'Scar Tissue UK' sports clothing company and 'Fight Factory Wrestling UK' for their home coming event. Thanks to Loki Films who filmed and produced our video. 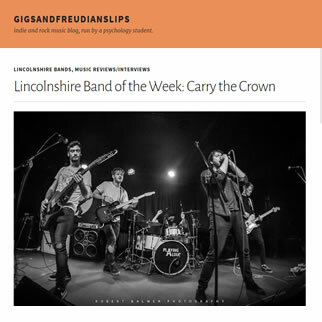 After getting in touch with BBC Introducing Lincolnshire they have played all our tracks over the last few weeks. We were invited for an interview with the Introducing Team which was great fun. 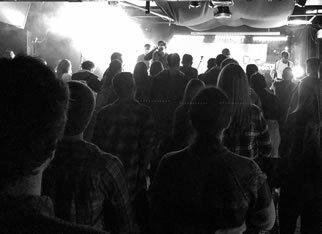 Headlined a great gig with a large crowd at Lincoln Uni Rock Soc at 'The Platform' venue. Thanks to all the bands who supported us and the people who gave a warm welcome, hope to see you again soon.